What is the Coastal Wetlands Planning, Protection and Restoration Act (CWPPRA) or Breaux Act? The Coastal Wetlands Planning, Protection and Restoration Act, (CWPPRA pronounced kwǐp-rŭh), is federal legislation enacted in 1990 that is designed to identify, prepare, and fund construction of coastal wetlands restoration projects. These projects provide for the long-term conservation of wetlands and dependent fish and wildlife populations with cost-effective plans for creating, restoring, protecting, or enhancing coastal wetlands. In Louisiana, CWPPRA is often called the “Breaux Act” in honor of U.S. Senator John Breaux, who helped initiate the legislation. What causes coastal land loss in Louisiana? The basic reasons for coastal land loss include both natural causes and human activities. Natural causes include hurricanes, subsidence, wave erosion, sea-level rise and salt-water intrusion. 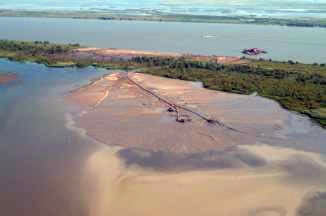 Human activities causing land loss include the construction of a variety of devices that regulate water and sediment deposition in Louisiana. These include the construction of river levees, large water control structures, the Gulf Intracoastal Waterway, ship canals, and access canals. 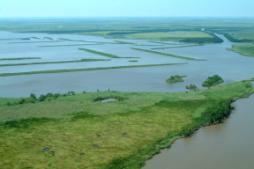 CWPPRA funds help to restore Louisiana’s vanishing wetlands. Approximately 40 percent of the coastal wetlands of the lower forty-eight states are located in Louisiana. Unfortunately, this fragile environment is disappearing at an alarming rate. Louisiana has lost up to 40 square miles of marsh per year for several decades – that’s 80 percent of the nation’s annual coastal wetland loss. To date, Louisiana has already lost coastal land area equal to the size of the state of Delaware. This loss is at an average rate of a football field every hour. If the current rate of loss is not slowed by the year 2040, an additional 800,000 acres of wetlands will disappear, and the Louisiana shoreline will advance inland as much as 33 miles in some areas. Since 1990, CWPPRA has funded wetland enhancement projects nationwide, designating between $30 and $80 million annually for work in Louisiana alone. 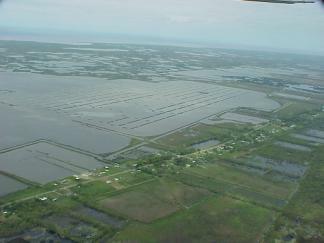 As of July 2011, there were over 155 CWPPRA coastal restoration projects in Louisiana, helping to build new land and demonstrating the use of new techniques or materials. 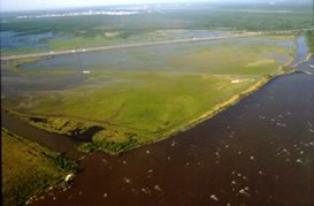 What is currently being done by CWPPRA to restore coastal Louisiana? There are currently 153 active CWPPRA projects. In September 2016, 108 projects were completed, benefiting over approximately 100,000 acres. 17 projects are currently under active construction with 23 additional projects approved and in the engineering and design phase of development. Why are Louisiana wetlands important? 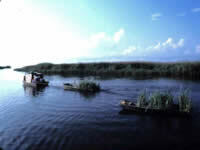 Louisiana wetlands are unique and vital ecological assets. Wetlands act as a storm buffer against hurricanes and storms. They act as flood control devices: holding excess floodwaters during high rainfall (much like a sponge). Wetlands replenish aquifers, and they purify water by filtering out pollutants and absorbing nutrients. Wetlands provide habitat for a variety of wildlife. Coastal Louisiana lands are the breeding grounds and nurseries for thousands of species of aquatic life, land animals, and birds of all kinds – including our national symbol, the bald eagle. This ecosystem also provides a migratory habitat for over five million waterfowl each year. There are many ways you can help. The first step is learning about Louisiana’s coastal land loss and restoration efforts. You may also choose to participate in public meetings so your ideas will be heard. You can support restoration projects you believe in, and you can help to protect water cycle, since ninety percent of the rain that falls in coastal Louisiana returns to our wetlands. You can protect the water cycle by properly disposing of household products, sensibly using pesticides, maintaining healthy septic systems, and containing chemical spills. You may also want to volunteer with coastal restoration activities, such as vegetative planting activities, in your area. How can I contribute financially to help conserve and restore coastal Louisiana? To contribute financially to conservation and restoration efforts along coastal Louisiana contact one of the coastal wetland stakeholder groups or one of the federal or state CWPPRA partners. Learn more about the coastal wetland stakeholder groups or CWPPRA partners here. How much land has been restored through CWPPRA in coastal Louisiana? Since 1990, a total of approximately 100,000 acres have been created and over 355,647 acres have been enhanced in Louisiana using CWPRRA funds. What are the basic techniques used to restore coastal wetlands in Louisiana? 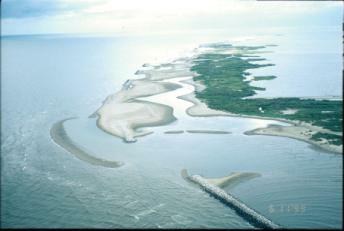 The most common types of restoration techniques include water diversion, shoreline protection, barrier island restoration, outfall management, dredged material/marsh creation, hydrologic restoration, sediment and nutrient trapping, marsh management, and vegetative planting. Where do CWPPRA funds come from? CWPPRA project planning activities are 100% federally funded. Once a project is approved, cost sharing is 85% Federal and 15% non-Federal. The non-Federal funds are often State funds. How do I contact my legislators and government officials to let them know my views on coastal land loss in Louisiana? Why is CWPPRA also known as the Breaux Act? In Louisiana, CWPPRA is also known as the Breaux Act because two U.S. senators from Louisiana, U. S. Senator John Breaux and U. S. Senator J. Bennett Johnson, were instrumental in getting the legislation initiated and passed. 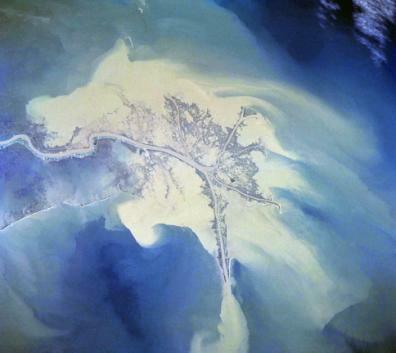 Senator John Breaux has since played an active role in keeping the Louisiana coastal land loss issue an active concern among fellow governmental officials and American citizens. Senator Breaux has also been an advocate for restoration activities taken on by CWPPRA. 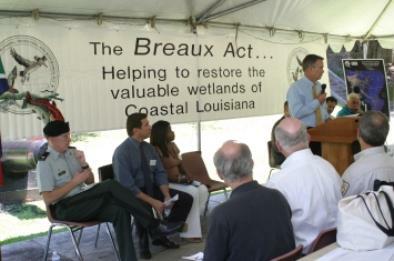 In keeping with his commitment to coastal restoration, Senator Breaux has often served as a speaker and Master of Ceremonies at CWPPRA project dedications. Are other areas of the United States also experiencing similar habitat loss problems? Coastal land loss does occur in other areas of the United States but not at such an alarming rate. Puget Sound in Washington, Narragansett Bay in Rhode Island, San Francisco Bay in California, Galveston Bay in Texas, the Hudson-Raritan Estuary near New York and New Jersey, Long Island Sound in New York, land near the Gulf of Maine, North Carolina estuaries, Tampa Bay, the Florida Everglades, as well as many other wetland areas have experienced habitat loss. Managing any of these delicate habitats is a complex process. Where can I get educational materials about coastal wetland land loss and restoration in Louisiana? Educational materials are available through the CWPPRA Outreach Committee and the Louisiana Wetland Education Coalition. To learn more visit our education page or email us. What is the actual text of the Coastal Wetland Planning, Protection and Restoration Act (CWPPRA)? What informational products does CWPPRA produce? How can I subscribe to the WaterMarks magazine? To have WaterMarks delivered to your home, send your mailing address to lacoast@nwrccom.cr.usgs.gov. To have the CWPPRA Newsflash delivered to your email address, request a subscription. How can I get a presenter to come and speak to my organization about coastal land loss and CWPPRA restoration projects? To schedule a speaker, contact Mirka Zapletal at mzapletal@usgs.gov or call (337) 266-8623. What is the CWPPRA Task Force? The CWPPRA Task Force manages the CWPPRA program. The Task Force is composed of the State of Louisiana and five Federal agencies: the U.S. Environmental Protection Agency (EPA), U.S. Fish and Wildlife Service (USFWS), USDA-Natural Resources Conservation Service (NRCS), NOAA-National Marine Fisheries Service, and the U.S. Army Corps of Engineers (USACE). Learn more about the organization of the CWPPRA Task Force and its subcommittees. How does the Mississippi River affect the Louisiana coast and its wetlands? During ancient times the Mississippi River would naturally overflow its banks in the springtime, providing new sediments and nutrients to the coastal area from 32 interior states and southern Canada. Over past centuries, a tremendous amount of suspended soil was deposited in the shallow Gulf of Mexico, eventually creating new land in south Louisiana. The Mississippi River system is now controlled with a series of levees, so the majority of sediment the river carries down is dropped off the continental shelf into the deep water of the Gulf of Mexico. Thus, Louisiana’s wetland is basically experiencing sediment starvation. Current CWPPRA restoration activities are helping to change this situation. 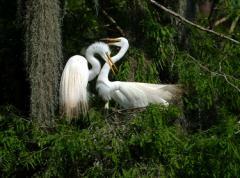 The Mississippi River has been the lifeblood of the Louisiana wetlands for thousands of years. Maintaining the delicate balance between human activities and natural processes along the Mississippi River may be the environmental challenge of this century. How do you want your Web site cited in the list of references for my research? Last name of author, First initial, Year, Title of Article, Title of Magazine (if using one) including month, year and issue number, CWPPRA, available at https://www.LaCoast.gov/… … ….aspx. What are DOQQs and how can I get copies? How do I bid on a Coastal Wetland Planning, Protection and Restoration Act (CWPPRA) Project? There are basically three agencies responsible for the bids that go to the Technical Committee. The Technical Committee (TC) is established by the Task Force (TF) to provide advice and recommendations for execution of the Program and projects from a number of technical perspectives, including: engineering, environmental, economic, real estate, construction, operation and maintenance, and monitoring concerns. The following three organizations should have information on how you can bid on Coastal Wetlands Planning, Protection and Restoration Act (CWPPRA) projects. Where can I find answers to other questions I may have about Louisiana’s coastal land loss? You may want to start by checking our Links page or you may e-mail us at LaCoast@nwrccom.cr.usgs.gov and we will be glad to help you.